Try to tilt the phone and observe how the flame follows the movement of the phone. If you want to stop the fire, close the top cap by simply shake the phone again. Surprise your friend next time he asks you to light on his cigarette. Present him your virtual lighter. Realistic movement of the flame and the casing will shock your friends. This application can also replace the real lighter on the concert or on a romantic date. ☆ Realistic action of the casing and the flame. ☆ Putting out the flame by blowing towards the phone. 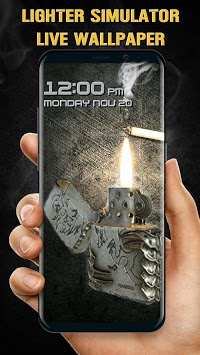 The 3D Virtual Lighter Simulator & Cigarette Live Wallpaper has a huge theme store. 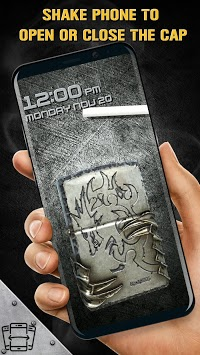 We provide you more than 1000 stylish live wallpaper themes! With various styles, you can choose your favorite one anytime and anywhere. Don’t hesitate to download this live wallpaper. ※ More personalized -1000+ animated wallpapers & themes. ※ Realistic effect - 1080 full HD realistic wallpapers provide. ※ Weekly update - Weekly update more 3D wallpapers with different styles. 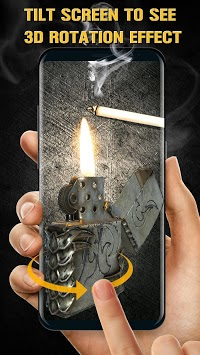 🎨Plenty of live wallpapers like Surprise your friend next time he asks you to light on his cigarette. Present him your virtual lighter. Realistic movement of the flame and the casing will shock your friends. We have a live wallpaper theme store for phone. More than 1000+ HD free live wallpaper provided. Just enter the main page of theme store, you’ll see plenty of live wallpapers are waiting for you. Choose your favorite one! Don’t like the live wallpaper you just downloaded? Don’t worry. We have more styles for you. If you are a love nature, we have waterfall, rain, aquarium and ocean theme backgrounds. If you are a science and technology lover, you'll love our galaxy night and analog clock style wallpapers and backgrounds，with magic effect, you’ll like them. If you like animals, you can find cute animal live wallpaper such as cat, snake and dog or cool lion and wolf wallpaper themes here. If you love sea animals, we have cute fish 3D live wallpapers with vivid water simulation moving effect. If you prefer live weather function, we have free awesome 3D real-time live weather theme wallpapers. Our live wallpapers come from high quality pictures or videos, with realistic 3D animated touch moving effects or magic parallax effects, that's very adaptive for your device.Also with different themes like 3D robot, joker, vampire, 4K gun shooting and so on. Your screen will be more attractive in a minute with all these cool backgrounds. Our professional designer team updates new live wallpaper themes every week！Better to satisfy your needs for home screen.